Here is another 3d Letter Box project. This one is for Christmas, with a religious theme and more elegant, vintage color scheme. 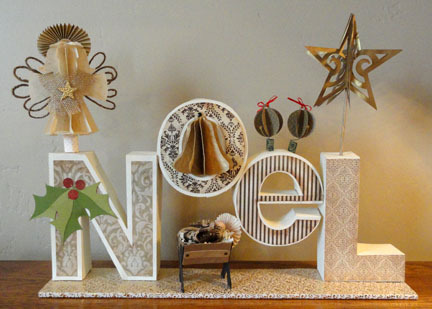 Besides the Letter Boxes from Snapdragon Snippets with Silhouette America, the display is embellished with 3d angel, flourished star, 3d star ornament, 3d jingle bells, and 3d manger. The lower case 'e' was not available when this project was envisioned, so I modified the 'O' shape on the grid design mat, then drafted a custom "bridge" piece. If you decide you want to try this project, I will send you the bridge and modified 'e' fronts. 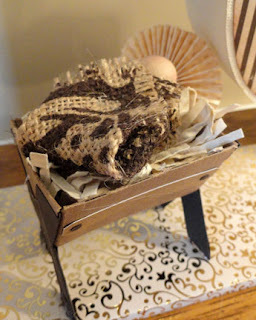 A details list page is also available, both by emailing a request to Jodi at hearthsewnpatterns@yahoo.com . A tutorial for creating the 'e' is also available on this blog. 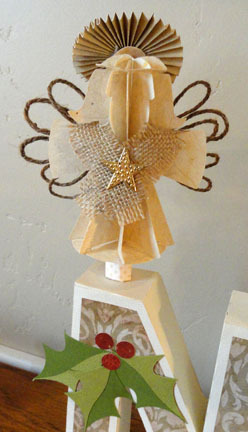 Here is a closeup of the Angel (and the holly cluster) that I changed and embellished. The original paper halo and wings were trimmed away, substituted with paper pleated rosette and shaped jute string loops. The Baby Jesus is a piece of dowel with wooden bead, painted and burlap-wrapped. 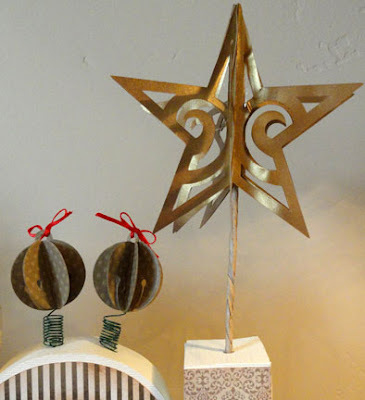 This is a closeup of the jingle bell balls representing the "umlaute" which is the name of the two dots that go above the 'e' in 'Noel'. Those silly little dots are intended to help us know that there is a distinctive pronunciation between the 'o' and 'eh' vowel sounds. Or perhaps you've seen something that'll give you inspiration for your own creative fun. Please watch for more 3d letter box ensemble projects in the coming months. Already in the planning stages are: SNOW, LOVE, LUCKY, SPRING, USA. Love the letters...how can I get the lower case letters? Cassandra, I developed the lower case letters myself, that is the "e", since the 'O' is just a smaller scale than the caps in this project. I have the "e" file that I can send you the file for, if you are interested. Its been a while, but I believe the "e" involves modifying the "o", then adding in a "bridge" piece that I have developed. The notes and the bridge piece are what I can send as a .studio file. If you have already purchased the capitals from SnapDragon Snippets, I will send them free.